Has the new school year started with gusto at your house? Or guesses? Does any of this sound familiar? Time for a change? 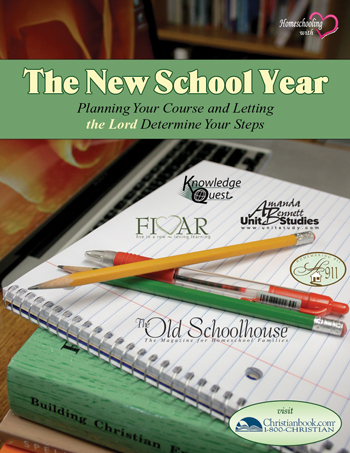 Get ready to plan a year of enthusiastic homeschool learning with consistent input from the Lord! Knowledge Quest enjoys regular contact with other like-minded companies willing to share their wealth of specialized information. Inside, you’ll find guidance and encouragement to assist you with all your planning needs. Get excited! This is a gathering of some of the best and brightest to share pointers and advice to get you going and keep you on track this year! You may have plenty of ideas-have you considered what the Lord wants for your homeschool? How has your homeschooling progressed this year? Is it possible that in all of the rush you have missed the hush of the Holy Spirit? Remember to let Him guide you throughout your days. His guidance, much like grace, is free to those willing to listen. “Something happens every August. Department and discount stores put everything from socks to paper clips on sale, waiting for mothers to come. And they do. In the frenzy that is ‘back to school,’ mamas fill backpacks with new pencils and crayons and fill their children’s closets with the newest and latest styles. It's all done just in time to get little Bobby and Suzie to school. For many mothers, this is where back to school ends. But somewhere, there is a mother holding her babies and looking out the window watching the bus go by. She is a homeschool mother, and she is wondering if she has made a mistake. That same mother spent the summer she had hoped to spend with her children planning, planning, and re-planning the school year just to sit down on the first day to interruption after interruption and no progress. She knows homeschooling is part of God's plan for her family, but she just can't get it together. Where did she go wrong? We've all been there in our homeschooling journey. Some of us more than once. Some of us every year. And some, day after day. Get ready for some butterflies this year-and not the nervous-stomach kind! The New School Year . . .
to all who will choose to download it. Now’s a good time-get your free E-Book! The Introduction by Karen Sargent will help you realize that many of us are very much like you. Karen has moved repeatedly as an active-duty Navy spouse, has run several businesses from home, and works part-time editing for The Old Schoolhouse®. She entered her 20th year of homeschooling in 2009 and admits she still needs help with planning and organization. She directs you with honesty: If you are the perfect homeschooling mom who never misses an event, keeps your children perfectly pressed and dressed, your home spotless, assignments completely organized, and everything in life functioning smoothly every single day, then you probably don’t need this book. But if, like Karen, you desire to run your home and school a little more smoothly and can admit to desiring some help, then The New School Year will bring you just that: a whole new, better-organized school year! Planning Your Homeschool Year ~ How to Cooperate With the Holy Spirit begins the book with encouragement from Steve and Jane Lambert, of Five in a Row. * Should you schedule your day as classroom teachers often do-systematically and with precision as to every piece of information you plan to teach on any given day? * Are you using the process of education to make disciples? Should you be? From a Biblical foundation and personal experience, they will remind you to stay focused on the Word of God as you decide how to plan your homeschooling year. Using Scripture to guide you, Steve and Jane share how all wisdom and knowledge is found in Christ, and that by planning to allow God to intercede into your studies, you and your children will find the Holy Spirit will determine your steps. Exactly how will you plan to do this? the educational jungle each year leaves God out of the plan. The Lamberts will show you how to find a better balance-with God’s guidance, prudent planning, and a little faith-filled R-I-S-K. Managing a Multi-Level Homeschool can be challenging. Malia Russell of Homemaking 911 takes us back to the common questions we all learned to ask when seeking answers. * Who? Exactly who is in charge of your home and, therefore, your homeschool? * What? Curriculum choices abound; are there ways to teach multiple grades easily? * When? Malia approaches two issues here-when will you introduce subjects and when will you actually do school? * Where? There are so many places to be: co-ops, field trips, sports, using the computer, and more. Exactly when will you be homeschooling at home? * Why? Work to the heart of “why” you homeschool with a series of revealing questions to guide your way. * How? Malia helps you give thought to how you will actually meet all of your responsibilities, and meet them well. Each of us can only juggle so many tasks-what will you choose as your focus this year? By expounding on breakdowns similar to this one, she helps you gain a better understanding of how to schedule lessons using any curriculum you choose-even without a predesigned schedule included! Then Terri shares thoughts on organizing your personal library-helping your homeschool run smoothly and keeping stacks of scattered books from overtaking your home. Finally, she advises you on the often overlooked task of maintaining control of our school boxes. Be sure clutter is banished while necessary tools haven’t vanished! Organizing the School Year With Unit Studies is easy when Amanda Bennett guides you through the many possibilities to consider. * Will you welcome a new baby this year? * Could your son’s soccer team make it to the finals? * Is it possible you will move during the year? Be enlightened as Amanda demonstrates how to plan a unit study around the changing seasons. Will your students be enjoying the changing seasons as Amanda urges you on? Find ideas for seasons, holidays, baseball, and more as you gain incredible insight from the imaginative creator of Amanda Bennett Unit Studies while improving the organization level of your own homeschool! Organizing and Planning Your School-Your “Special OPS” Mission will lead you on a mission designed by Cheryl Allin and The Old Schoolhouse® Magazine as you follow a three-phase plan to a fantastic year of homeschooling! * Phase One will help you organize your space-from paper to schoolroom and supplies; get some step-by-step help to make it happen! 6. Keep it That Way! * Phase Two works at planning your actual school year-evaluate the little things that matter in big ways. * Phase Three provides you the same guidance you give your children-take it all one step at a time; small steps lead to great success! An Epilogue by Ruth Beechick, with her years of expertise and matter-of-fact, straight forward attitude, will get you well on your way to making positive changes in your homeschool this year and for every year to come. This new school year can be your best! Begin planning today when you download this free ebook - The New School Year. Get your copy now! It is completely free. Homeschool planning can be intimidating. Handling students of multiple ages with different subject matter and several extra-curricular activities can be tough. Raising disciples and glorifying God is exciting! Gain insight into deciding what is necessary for your family and what is not. Enjoy a Biblical foundation as these popular Christian homeschool educators offer you words of encouragement and practical steps you can begin to take today. Reading The New School Year e-Book could make a HUGE difference for you this year! Change the I guess to “Yes”-You can do this! Get it now, our free gift to you! This free gift has been brought to you by Knowledge Quest, Inc. and its partnering companies. Enjoy!